Many people consider cutting back, starting new habits and putting a new foot forward at the beginning of a new year. The same concept is important for your dog, too. Our dogs can get into a routine of bad manners if we allow them. Those sweet sad eyes can make us give them extra treats, and let little things slide when it comes to their obedience. That's why a new year is a good time to help our four legged friends cut back on unwanted calories, become more active and maybe learn a new command or trick. To get your dog excited about a new training program, we suggest you start with these low fat, but very tempting dog treat recipes. If your heart is warmed by giving healthy homemade dog treats, you may be ready to take your passion to the next level. 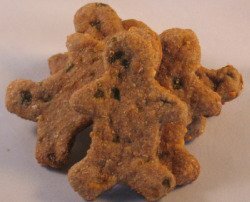 Starting your own dog treat business can seem overwhelming, but it doesn't have to be. January is National Train Your Dog Month. You may be thinking, but my dog already knows the command for sit and down and she walks great on a leash, what else does she need to know? How about these great tips on how to Help Your Dog Love Visiting the Veterinarian. Or, another fun concept, Teaching Your Dog to Play with Toys. 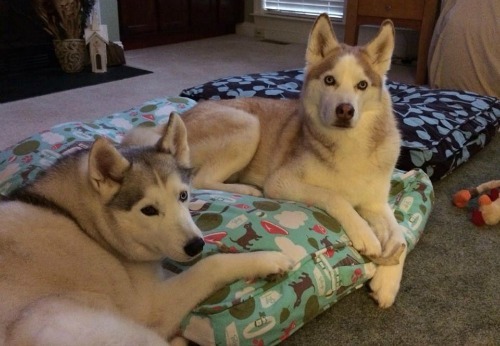 Our Featured Fans for January are Mya & Meeko. 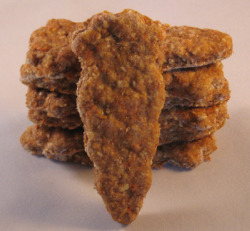 They even shared a picture of one of their favorite treats, my Pumpkin & Peanut Butter Dog Treats. 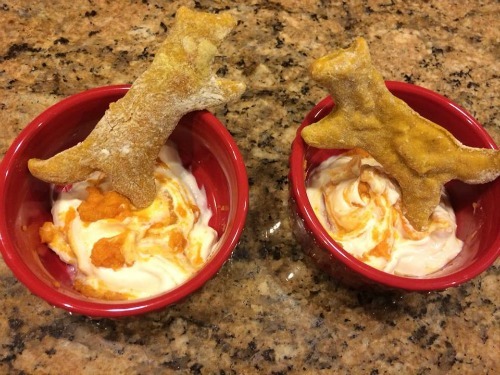 Their Mom has this to say, "My pups love the "Pumpkin & Peanut Butter Cut Out" treats. I add some yogurt in them and cinnamon and they go crazy for them! I make their treats for them every 2 weeks. Here is a picture of their cookie cut outs in the form of a sled dog and their yogurt/pumpkin treat." 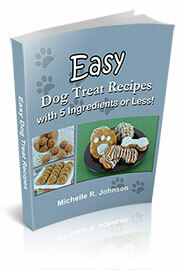 "I found a great recipe for dog treats in your site which were suitable for a pooch with Addison's disease. He tolerates them with no effects - HOORAY!!! Thank you." "I love your newsletter and site. Thanks so much for all the information. I'm kind of a novice, but your site has inspired me for my little dog."